Item description: * See scan - perfect condition. This is a scarce 19th century pair of 2 candlesticks / candelabras made out of solid bronze with patinated silver plating and gold plating as well. The pieces are most likely made in France and have a nice Empire style patinated silver and gilt contrast. The owls have superb detail and are masterly hand engraved. 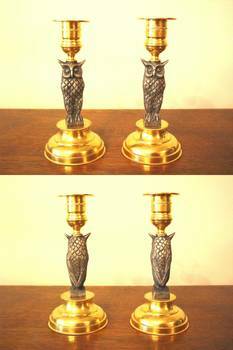 The gold plating of the base and top of each candlestick has been gold plated again some time ago probably as the original gold wash had worn out due to time and age, but the silver patina of each owl is still remaining in its extraordinary original look and feel. Both candlesticks are about 165 mm tall. Owls have strong symbolism in all mystic and paranormal activities and such candlesticks are well sought after many witchcraft followers. 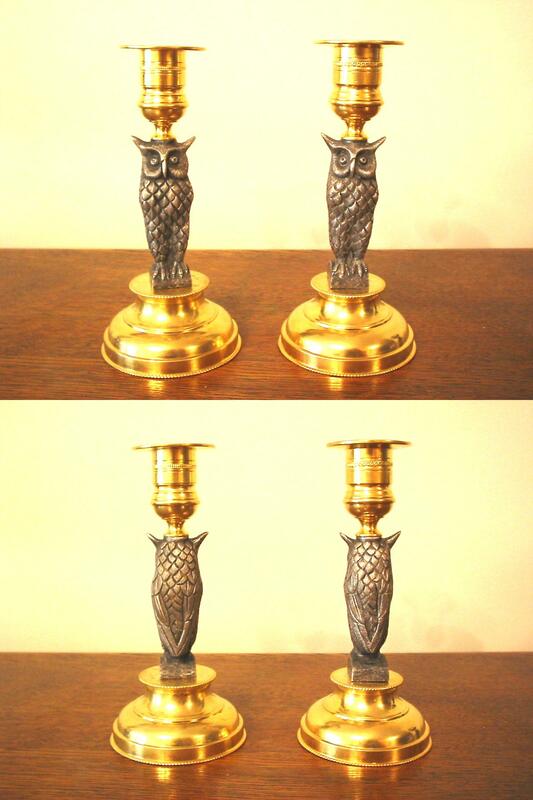 Scarce antique bronze collector pair and one of the nice French bronze antiques and owl candlesticks.